Sandwiches are a quick and tasty dish that don’t require Gordon Ramsay-level cooking skills to put together ‒ thank goodness. 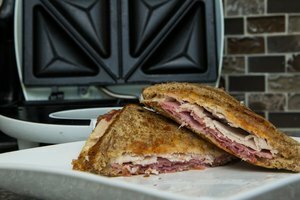 All you need to make a great sandwich are two slices of bread, a whole lot of yummy goodness smack dab in the center, and some sort of cooking device to get those perfect grill marks with a gooey melted cheese center. Your cooking utensil could be a sandwich maker, sandwich toaster or a sandwich press. These devices offer the benefit of convenience ‒ you can whip up some truly tasty combinations with the touch of a few buttons. 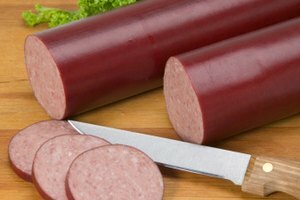 Here’s everything you need to know about the various types of sandwich makes to ensure you want to eat in tonight. The sky truly is the limit as to what you can make in these high-tech devices. Some of the easiest dishes to start with include. Egg sandwich: Not all sandwich makers are the same. 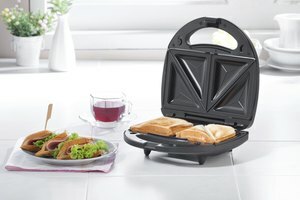 While a sandwich press involves heated plates on both ends that are pressed together, an egg sandwich maker, for example, lets you cook all the different elements at the same time. If you were to cook an egg on two slices of bread on a sandwich press, the egg would spill out on the sides. Instead, use an actual egg sandwich maker for that perfect egg sandwich breakfast every time. Omelets: The original Snackmaster Sandwich Maker was a hit in the ’90s, but in 2019, it’s a bit outdated. This is especially true since other companies have since come out with their own versions that are totally modernized. For example, most modern-day models feature the same cooking slots that make it possible to cook an egg omelet by simply adding the eggs and other ingredients, closing the lid, and letting it cook for a few minutes. Bacon: A sandwich toaster goes by many names and models, including “pie iron.” With it, you can whip up some delicious, perfectly crisp bacon. Simple add it to the heated plates, press down and wait a few minutes. Halloumi cheese: This soft, curd-like cheese is often used in grilled cheese sandwiches since uncooked, it’s nothing special. Once grilled, however, it becomes crisp and savory on the outside and melted and creamy on the inside ‒ sort of like a marshmallow. To grill halloumi on a sandwich press, simply cut up the cheese into medium-sized pieces, put them on a heated surface and grill for about 3 minutes. Some other uses for these types of sandwich makers include making French toast, potato fritters, pizza pockets, pastries and even donuts. Season the sandwich plates: If you thought seasoning was just for cast-iron pans, think again; it’s also a good idea before you use a sandwich maker, toaster or press. Simply use a light amount of olive or sunflower oil, and apply it to the plates. Make sure you do this regularly to ensure a non-stick coating. Season the bread you’re using: It’s a no-brainer to apply butter to the bread when making grilled cheese. Well, you’ll want to use that same process with bread when making all sorts of sandwiches to prevent the bread from sticking. While butter adds a great flavor, it might also add too much extra fat. If that’s the case, use olive oil instead. All these modern sandwich devices just might be the best thing since sliced bread. The Spruce Eats: What Is Halloumi Cheese or Grilling Cheese? Product Spy: How to Stop Bread Sticking to a Sandwich Toaster?